We're still lunching at home for the most part, so nothing too exciting here. We had another Muffin Tin Monday with English muffin pizzas. 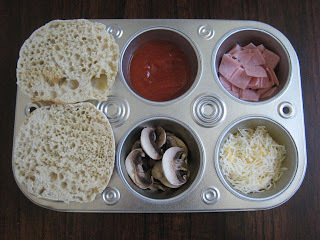 This is Faith's tin--English muffin halves, sauce, cheese, diced ham and mushrooms. Ben's looked similar but without the mushrooms. And occasionally, I send my husband food to work. He got spaghetti & meatballs with a side salad and dressing. I do like the Lock & Lock box for him, it works well and holds a lot. Shannon, where did you get that box? I'm looking for an adult-friendly way to bento my lunches when I go back to teaching in the fall. It's a Lock&Lock that I got at Target a couple of years ago. 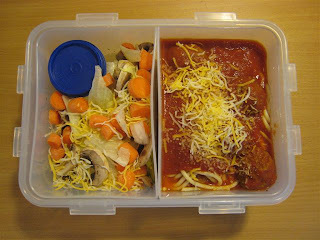 It works better for my husband than the Laptop Lunches since some of those containers are small for him (but perfect for me).